The Condor CV12 engine rated at 895 kW (1,200 bhp) powers both Challenger 1 and Challenger 2 MBTs. At the same rating it is also the prime mover for the Challenger Armoured Repair and Recovery Vehicle (CRARRV). During Operation Desert Storm the CRARRV achieved a remarkable availability of 100 per cent; Challenger 1 itself achieved a very creditable 98 percent, with both vehicles averaging some 100 km per day during the entire campaign. A CV8 diesel engine rated at 400 hp is currently undergoing trials in a MLI-84, a Romanian version of the Russian BMP-1 infantry combat vehicle. The Scammell (now UNIPOWER) Commander, which uses the Condor CV12 rated at 470 kW (625 bhp), completed a total of around 2.5 million km, an average of 260 km per day per vehicle for the entire campaign. The CV12 engine has been evaluated by the US Army Tank Automotive Command (TACOM), rated at both 895 kW (1,200 bhp) and 1,120 kW (1,500 bhp). At 1,120 kW the engine completed performance testing in excess of 300 hours assessing altitude capability, fuel tolerance, temperature tolerance and so on. Reports concluded that from the performance, fuel economy, power density and multifuel points of view, the engine was very attractive for application in the M1 and similar vehicles. The evaluation was carried out as part of the Military Assessment of Commercial Items (MACI) programme. The Perkins Engine Company has supplied prototype power packs to Pakistan for trialling in the new Al Khalid MBT. The power pack consists of the combat proven Perkins Engines Company 1,200 hp CV12 Condor diesel coupled to the French SESM ESM 500 automatic transmission which is fitted to the French Army version of the Leclerc MBT. The power pack is fitted with a full-authority digital power pack management system which has been developed exclusively for the Perkins Engine Company as part of the programme. Following an international competition in January 1995, United Defense LP of the USA announced that it had selected the Perkins CV12 diesel coupled to the now General Dynamics Defense Systems (previous Lockheed Martin Defense Systems) HMPT 1250-EC automatic transmission as the power system for the Crusader, the US Army's future 155 mm fire support weapon system. 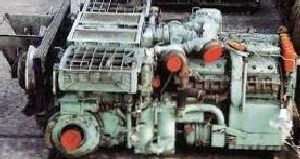 The Perkins Engines Company has already supplied a number of engines for use in the trials programme. Power pack integration will be carried out by General Dynamics Land Systems. Crusader consists of the artillery system, previously called the Advanced Field Artillery System (AFAS) and its associated Future Armored Resupply Vehicle (FARV). A total of 1,648 vehicles (824 of each) are expected to be procured. It is expected that full production will commence in 2005. Perkins' own continuing programmes in^the field of armoured fighting vehicles involve installation studies and prototype builds to assess the suitability of Condor for retrofit opportunities in such vehicles as M1 Abrams and Leclerc, both at 1,500 bhp, Chieftain and Centurion at 750, 900 and 1,000 bhp, T-series and AMX-30 at 800 bhp, AMX-30 at 740 bhp and M41 at 475 bhp. A prototype 1,000 hp power pack, designed by NIMDA of Israel and comprising a Perkins CV12 engine and an Allison XTG-411-6 automatic transmission is currently undergoing trials in a modernised Czech T-72 MBT (this section under Israel). In production. In service with the British Army and a number of other armed forces including Kuwait (Desert Warrior) and Oman (Challenger 2 and Challenger Armoured Repair and Recovery Vehicle).